It was his chance to rebuild a career that seemed in terminal decline. But Lamar Odom has managed to fumble a dream opportunity to play for the New York Knicks after being axed by the franchise. After well publicised claims of drug abuse, it seemed like Khloe Kardashian's estranged husband had been handed the chance of a lifetime after signing a deal with his hometown team in April. However even reuniting with legendary coach Phil Jackson, who works as the team's president, was not enough. Success would have gone a long way towards disproving the gigantic forward's doubters, especially as it is said his wife demanded a divorce, over claims about his drug use and infidelity. An insider told Us Weekly: 'There was a lot of hope there when he had his first initial talks with Phil [Jackson]. He gave him a real shot. Phil, who coached Odom on two Los Angeles Lakers title-winning teams in 2009 and 2010, announced in April he had signed Lamar for the remainder of the season, which ended that same day. The unusual deal, which would have seen him earn the pro rate $8,500 for a single game, was designed to give the franchise's coaching staff a chance to see him work out and assess his fitness with a view to signing him for the 2014-15 campaign. Such a move was far from certain however, as the 6'10 player's foray into European basketball was cut short this year by a back injury. He played just two games for Spanish club Laboral Kutxa Baskonia, who he signed for in February, and managed just 23 minutes on the court. 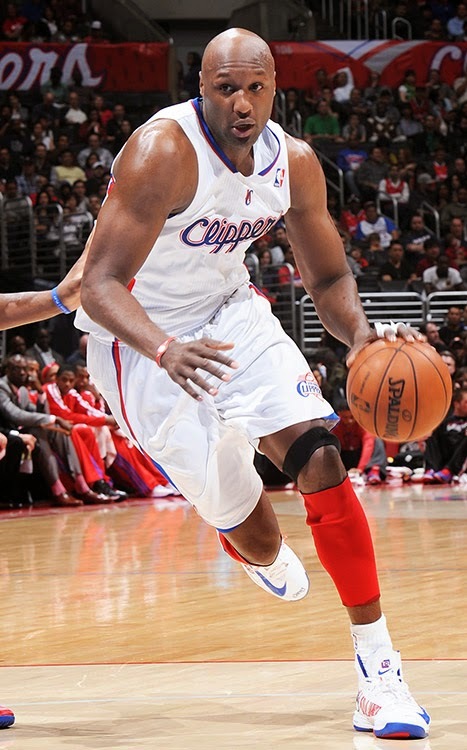 Two-time NBA champion Lamar last played in the league in 2012-13 with the Los Angeles Clippers, who decided against renewing his contract.